All hamster owners should know about Hamster Scent Glands. 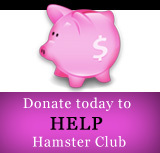 Hamster scent glands are also sometimes referred to as hamster flank glands or hamster hip spots. Male hamster's scent glands tend to be more prominent than the female hamster's scent glands. All hamsters rub their scent glands to areas both in their cage and/or in the room (while roaming during play time) to mark their 'territory'. The Syrian Hamster's scent glands are located on the hips; one on every side of the hamster's hips. The Syrian Hamster scent glands are also very often wet looking. On the other hand, the Winter White Hamster, the Campbell's Hamster, the Roborovski Hamster and the Chinese Hamster's scent gland is located on the ventral midline and close to the hamster's umbilicus. The hamster's scent gland often also excretes a yellow secretion. A hamster owner must always keep in mind that sometimes the hamster's scent glands become very visible especially when the hamster starts aging and when the hamster room's temperature is hot. 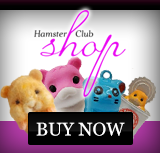 Also keep in mind that hamsters are most comfortable at temperatures between 65�F / 18�C and 80�F / 26�C, thus it is very important to put the hamster's cage in a room that has this temperature range.